Perkins+Will designed the new offices of a wearable tech company in San Francisco, California. 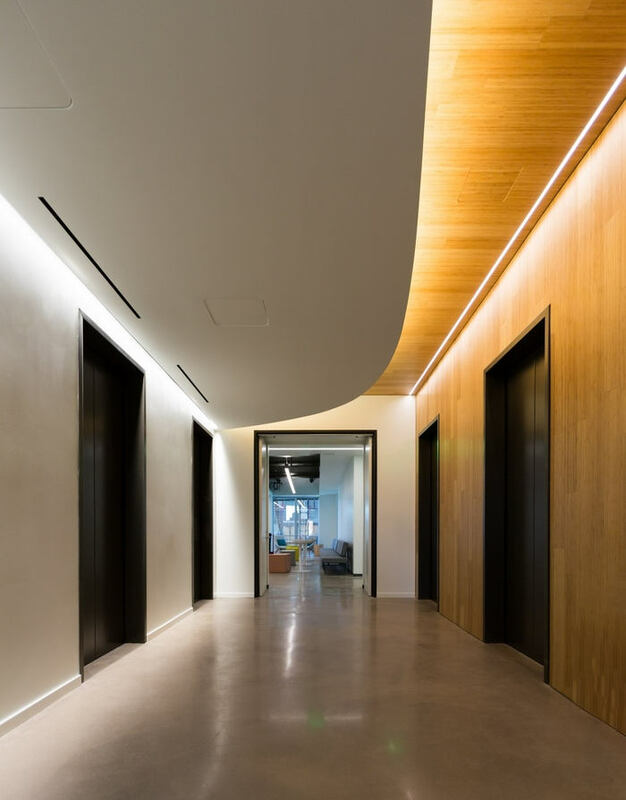 At the heart of a 3,000 employee urban campus, the Customer Center acts as the front door to this Wearables Technology company in San Francisco’s South of Market neighborhood. Designed to allow for a variety of public functions, this floor features a flexible floor plan with main reception, brand display galleries, recruitment interview rooms, UX research facility and innovation research gym. A front of house space where product lines can be launched, new recruits get there first welcome and customers give valuable feedback on products, this project is part office space part brand experience. Sleek interior finishes allow for the company brand to be represented in an elegant and welcoming environment. 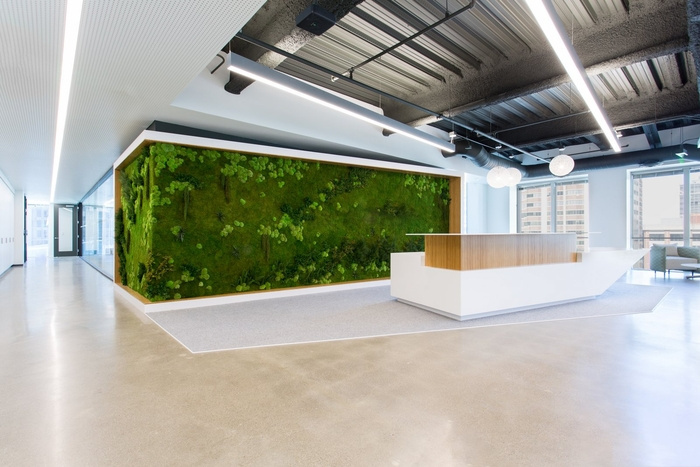 The reception wall features the biomimicry of the company’s products with a 25 foot green wall and a floating reception desk reminiscent of the company’s P.O.P. sales displays in both materiality and forms. The brand display galleries hold space of digital and physical brand displays complete with a 45 foot long seamless video wall, gallery-style display cases and brand graphic wall displays for new and existing products. Throughout the space built-in technology reflects the lifestyle brand of the company with seamless room scheduling, hidden user observation cameras and ambient music throughout the Customer Center. New recruits are guided from the reception desk through the brand display areas to their individualized interview rooms where current employees conduct employment interviews in a fully brand specific environment. The flexible floor plan allows for public gatherings; continuing innovation and research; as well as acting as a welcoming center for new employees.